Update October 2017: My mom returned again in July to our ancestral hometown in Castelvetere sul Calore to film with me for for season 2 of Dream of Italy on PBS. “Mom, you need to get better so we can go back to Italy,” I said, mustering the little energy I had to sound more convincing than I felt. Just before Christmas 2015, my mother was in a hospital bed at Sloan Kettering Memorial Cancer Center in New York City having just received a devastating and sudden diagnosis of a rare form of stage 4 bladder cancer. I’m an only child and our little family is so very close; my father and I felt like a bomb had exploded in front of us. I wasn’t sure my mother – who had always been healthy and vibrant – would make it out of this hospital room and I was even more certain that another trip to Italy – we had made more than 20 trips together and our travels were the glue that bonded us even closer as adults – would never be in the cards. But I should have known not to underestimate my mother, who more than anyone in my life, well before her cancer diagnosis, taught me everything I know about resilience and perseverance. “I thought she was indestructible,” my father said through tears when my mother was diagnosed. It turns out she is…for now. Soon after her diagnosis, the stars aligned for my mother to receive a new checkpoint inhibitor drug for bladder cancer (that has since been approved by the FDA). There had been no new drugs for this deadly disease in decades and aggressive chemotherapy, which can stave off the cancer but often not for long, and with brutal side effects, was the only other option. My mother tolerated the drug well and over the course of her treatment started to feel more like her old self. Though she continues to have a constant reminder of her condition in the form of the nephrostomy tubes that extend from her back into bags (to empty her kidneys) on each of her legs, my mother has even made the best of that. “Turning lemons into lemonade,” as her surgeon said when my mom showed him the necklaces she now makes from her unused medical tubes. 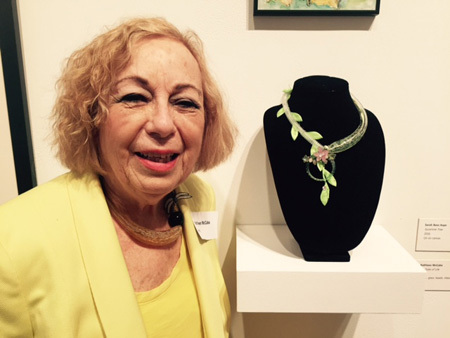 One of her Tubes of Life necklaces– as she has named them – was featured in a juried art show at a local museum. Part of the proceeds supports the research of her doctor Dr. Jonathan E. Rosenberg at Memorial Sloan Cancer Center. We first traveled to Italy together 22 years ago in a trip that changed both of our lives mostly because we returned to my mother’s grandfather’s ancestral hometown Castelvetere sul Calore. No one in my mother’s family had reaturned in a century, though her father had tried and failed. As my mother said at the time, “It was like Brigadoon, the whole town came together to welcome us.” Seven years later, I would found Dream of Italy to devote myself to Italy full-time and a few years later, my mother started Dream of Italy Designs, making jewelry from pieces sourced in our favorite country. Landing in Rome last month on a clear, beautiful day, we picked up our rental car and it was like the band was back together! My mother and I (me always driving – she, sometimes scared in the passenger seat) were back on the autostrada where rules are only suggestions – something I love and she doesn’t. The sun was shining, the windows were down, my mother was beside me and we were singing along to our favorite song from the musical Hamilton, appropriately named, You’ll Be Back. It was truly one of the sweetest moments of my life. She was right. I mean, who doesn’t love a castle? Especially one that has been completely renovated and whose grounds boast 360-degree views of the treasures of Tuscany. We felt right at home with the proprietor Antonio and I told him over wine that my mother sometimes doesn’t have a filter when she talks and I’m tempted to give her a nudge under the table when this happens but she will just foil me, by saying out loud “Why are you kicking me?” with a smirk. Later, when our dinner with fellow guests turned to a spirited but respectful discussion of politics, Antonio asked if I had nudged her. “Nope! It wasn’t her this time,” I said with a smile. Next stop – the exquisite hot springs resort Adler Thermae in Tuscany’s Val d’Orcia. I had visited on my own in 2007 and had spent 10 years dreaming of returning. I was so happy to bring my mom this time. We spent our days enjoying spa treatments, eating (way too much) and taking drives around the countryside including one at sunset that again was sweeter than sweet. 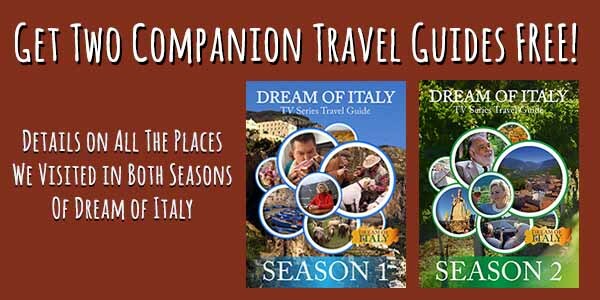 We’re in the process of filming season two of Dream of Italy for PBS. My mother has been such a part of what makes Italy special to me – over the years, we have dressed up for Carnevale in Venice together, watched the Olympics in Torino, cruised the coastline (with my dad), celebrated Christmas in Rome (with my dad), ridden on the Orient-Express, taken numerous cooking classes – that I wanted to include her in this season. I also wanted my mom to see what it was like to film the show. 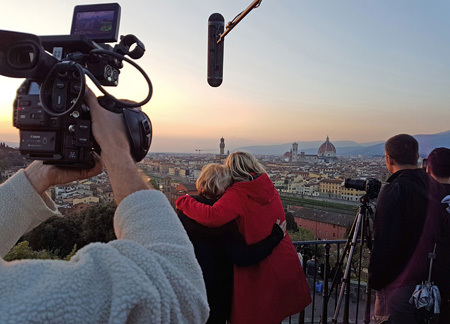 Early one morning, a hair and makeup team showed up at our room at the Grand Hotel Minvera and it was the start of incredible day in Florence – all filmed with my mom. 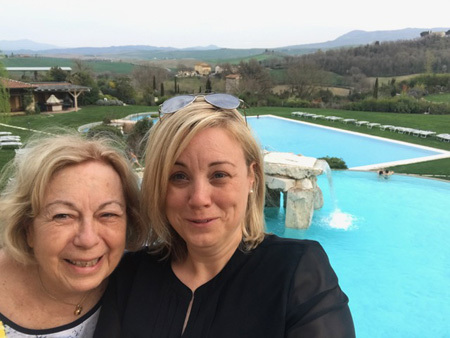 We took a class in making cantucci, cheered with vin santo, enjoyed bistecca Fiorentina for lunch, ate gelato and filmed an interview on the stunning rooftop of Antica Tornabuoni about the memories we have made over the past 22 years. One of our favorite memories is from more than a decade ago when were in Florence hotel room and laughing so hard that the person in the room next door called security! 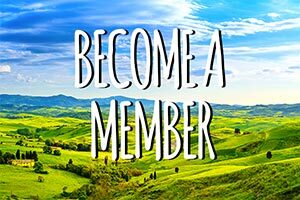 We talked about what Italy means to us…it was a once-in-a-lifetime day that culminated in sunset at Piazzale Michelangelo. Shooting television is long and intense and my mother was a trooper filming for almost 11 hours. We ended the night with dinner at our favorite restaurant, L’Osteria di Giovanni. We did it. 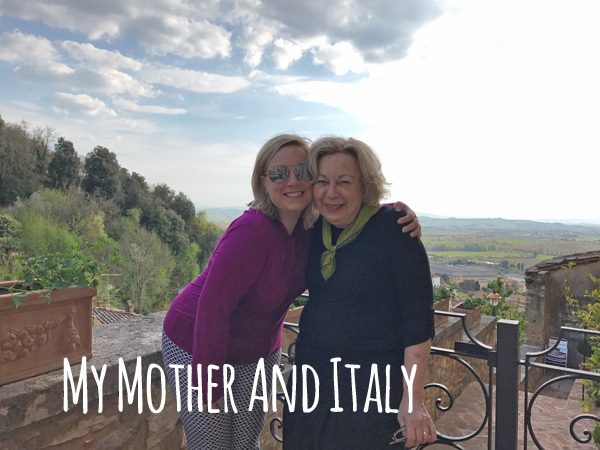 We took the miracle my mother has been given and ran…right to Italy! 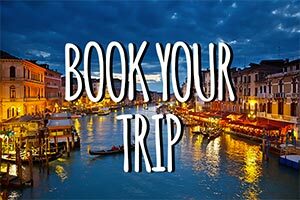 I hope our story, her story, can inspire you to go to Italy with someone you love or go back with someone who means something to you. To do it now. To make every moment count. And to never give up. I wish all the mothers reading this a most beautiful Mother’s Day. To my own mother, on this day, I want to tell you how proud I am of you and that the greatest honor of my life has been to be your daughter. I ask you to remember what King George sings in the musical Hamilton — “You’ll Be Back”! I look forward to our next trip to Italy!